Hey Coffeeholics! SALE ALERT next week! Don't miss out on the 6th MegaBrands Sale that will open on Friday to Sunday, October 4-6, 2013, from 10AM to 9PM, at the Megatrade Hall 1, 2 & 3, at the 5th level of Mega B, SM Megamall. Following its five successful annual staging of this event, MCT Events Management offers the 6th edition of the MEGABRANDS Sale. The three-day event showcases more than 200 known brands, both local and international, under one roof. Awesome right? Get ready Coffeeholics and shop til you drop as all you shoppers from all walks of life will surely enjoy HUGE discounts on great selections from shoes, bags, men’s and ladies fashion, sporting goods and accessories, personal care, eye wear, time pieces, and other specialty items. Special discounts and promos also await shoppers on gadgets, gizmos and other tech brands. Participating companies and well known brands will hold inventory sale or end-of-season sale. The Event is open to shoppers looking for great bargains before the Christmas season sets in. So better check this out for your advanced Christmas shopping! Pasok sa budget! Over the years, this Event has established a growing market of loyal shoppers, and has always been one of the most anticipated annual events. Shoppers will enjoy up to 70% discounts from participating brands like Adidas, Nike, Reebok, Cole Hann, Crocs, Levis, Dockers, Vans, CMG, Oakley, Figlia, Sanuk, Ellese, Tomato, Carlton, Elle, Slazenger, Yonex, Wilson, Victor, Nike Golf, Ogio, Bridgestone and many more. RCBC Bankard, still the official bank partner of MCT Events for this event, shall treat its credit cardholders with 0% interest for up to 12 months. There are also special giveaways and freebies for those who will sign up and apply for RCBC Bankard credit card during the event. As usual, admission is free and all major credit cards are accepted. 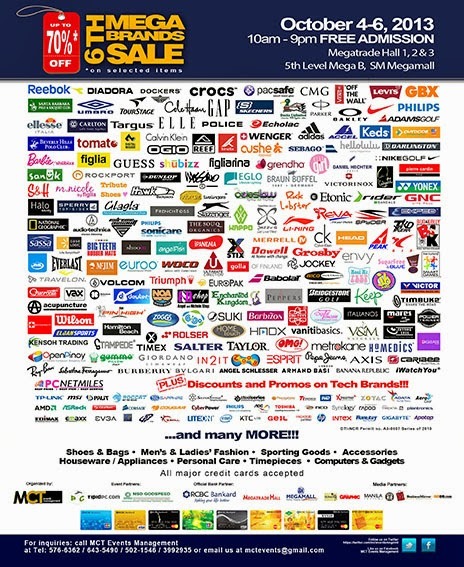 Before the Christmas Shopping RUSH begins, make your way to the 6th MegaBrands Sale. You’ll be surprised that with the wide array of choices, you can find something that you’ll need long after the Christmas is long gone. Step 1: Click the link above then click on "Join" at the top of the page. Step 2: Click "Invite Friends" at the top of the page and select your friends. BE UPDATED: For more information about the event, call MCT Events Management at 502-1546 or 399-2935, 643-5490, 576-6362. You may also follow through Facebook Fanpage: www.facebook.com/MCT-Events-Management or in twitter: @mcteventsmngmnt for more updates on this event. Brew of the Day - kaisensei.blogspot.com.